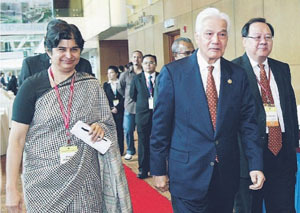 Prominent guest: Bar Council president Ambiga Sreenevasan (left) and organising chairman Roger Tan (right) escorting Sultan Azlan Shah to the opening of the 14th Malaysian Law Conference at the KL Convention Centre on Monday. SULTAN Azlan Shah chose to call it a disquiet about the judiciary but among many Malaysians, it has been a very loud grumble for the past few years and in the more recent past. Only the ignorant and those who chose to do so, presumably for political expediency, have failed to take notice of the allegations that our judiciary has been tainted. Allegations of judges on holiday with business tycoons to a prominent lawyer brokering appointments of top judicial positions have seriously harmed the image of the judiciary. Some have even questioned the integrity of our system in certain murder trials, claiming serious irregularities. These allegations may have no basis and in some instances, may have come about due to the lack of legal knowledge of the public. Nevertheless, they have tarnished the image of the judiciary and could lead to the erosion of public confidence in the institution. There was more plain talk from him – he pointed out the unprecedented act of a former Court of Appeal judge writing in his post-retirement book about erroneous and questionable judgments delivered by the higher courts. He also cited a case of medical negligence involving the death of a lawyer which took 23 years to reach the Court of Appeal, saying there have also been reports that some judges had taken years to write their grounds of judgment involving accused persons who had been convicted and were languishing in death row. We have a serious problem, as Sultan Azlan said – there are perceptions that our judges are not independent and worse, incompetent. In short, the public must never perceive that there are two sets of law – one for the powerful and one for the ordinary people. The average Malaysian must never assume that the odds are against him in court because the judge would favour those with political or business influence. Impartiality, in a nutshell, is the core of any judiciary. Some of us may not like to hear this but more and more we keep hearing this, with many cynically predicting the court decisions of certain cases, even before the verdicts are delivered. There have been one or two surprising judgments over the past few years but they are not enough to restore public confidence, even if our politicians are quick to cite these cases to point out that the independence of the judiciary is intact. Malaysians do not want our judges to be anti-establishment to be deemed independent. Far from it. What they are seeking are fair and just judges. If we may add, sound and competent ones too, who also take time to back their written judgments with proper citations. It is important to note that Datuk Seri Abdullah Ahmad Badawi has responded positively to the call by the Bar Council and Malaysians, in general, to reform the judiciary. His amicable approach is in sharp contrast to the statements made by one or two ministers, which seem to smack of arrogance with their quick defensive, but often simplistic, dismissal of any proposal to reform the judiciary. The “I know better than you, so shut up” line only works against the Government as many of these calls are genuine. Many are made by lawyers and voters who support the leadership. Malaysia would have a competitive edge over other countries if businessmen and investors believe that our legal system, which has been well established, is impartial. But when they start turning to arbitration, then it is something we need to pay serious attention to and ask ourselves why they prefer this route. It is a blow to read that a recent World Bank survey on resolution of commercial disputes ranked Malaysia poorly, 63rd amongst 178 countries. Hong Kong is placed first and Singapore ranks fourth. Ironically, both inherited the British legal system like Malaysia. Sultan Azlan has also pointed out that judges must be mindful that they are appointed judges of all Malaysians and must be sensitive to the feelings of all Malaysians regardless of their race, religion and culture. There is a perception that some judges may put their religion or race first when hearing cases involving religion or that they are seen to pass the buck by refusing to make a decision, preferring to pass that responsibility to another court. The Bench has to realise that, more than ever, judges would also be judged when they deliver their judgments.